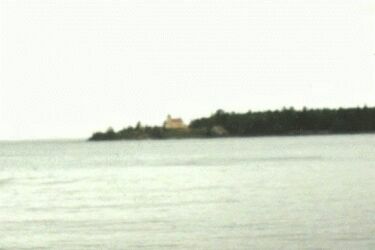 The first light located here was built in 1852, being the fifth lighthouse erected on Lake Superior. The original structure was completely replaced by the current structure in 1867. The lighthouse is surrounded by private property, with no official access road so it's not open to the public. You can, however, view it from a parking lot across the river. 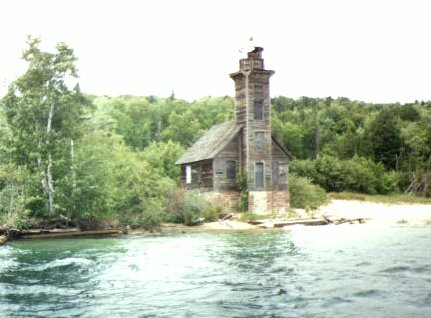 The current light replaced a structure built in 1874 to mark the entrance to the Portage Lake Ship Canal, now known as the Keweenaw Waterway, shortcut across the Keweenaw Peninsula. The light is at the end of a rocky pier in the McLain State Park. The first light was built in 1851 and has undergone many changes, including a new tower erected in 1871 and a fog signal added in 1895. The light sets on the tip of a narrow strip of rock that marks the western entrance to the harbor. 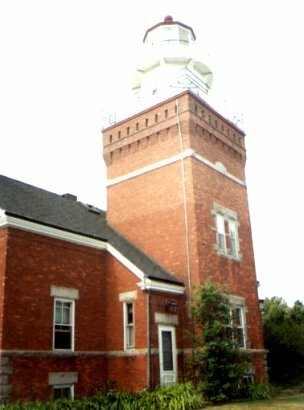 The Keweenaw County Historical Society runs a nautical and historical museum in the lighthouse and surrounding buildings, open from mid-June through the end of September. Built in 1866, replacing the original built in 1849, the light is on mainland State Park property, but has no access road, so the only way to get to the light is by ferry boat. We decided not to take the boat trip, as the weather was cold and rainy, maybe next year! 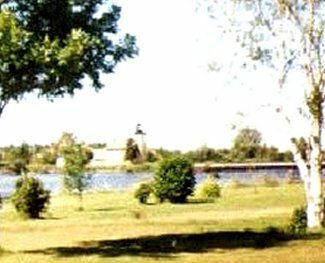 The building houses a nautical museum, and, also, in the State Park is Fort Wilkins, another historical site to visit! 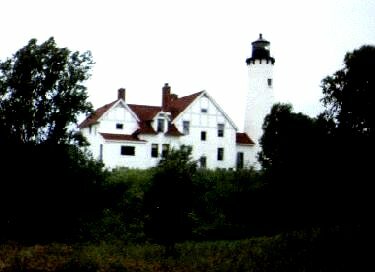 The Big Bay Point Lighthouse is the only lighthouse in Michigan that operates as a bed and breakfast inn. This light, built in 1896, is another of the duplex style lights and it sets atop a bluff nearly 100 feet about Lake Superior. 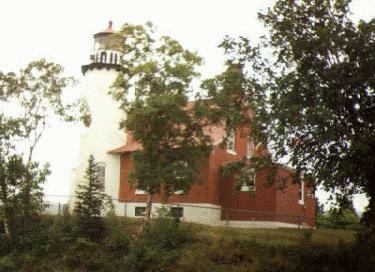 Built in 1868, this East Channel light was operated until 1913 when it was replaced by the new range lists at Munising. Privately owned, the structure was in danger of total collapse when a group of citizens, including the owner, decided to repair the tower and house. Built in 1849, Whitefish shares the honor with Copper Harbor for being the first lights on Lake Superior. Whitefish Point marks the heavily traveled approach to Whitefish Bay and the locks at Sault Ste. Marie. It is the only active light remaining along the southeast shore of Lake Superior. The area around Whitefish Point is known as the Graveyard of the Lakes because of the numerous dangerous shoals in the area. 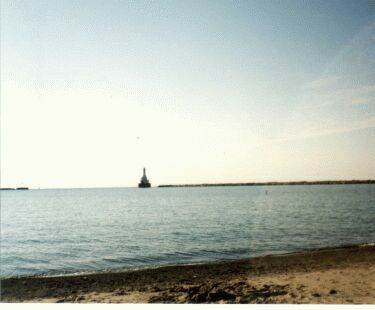 Seventy major shipwrecks have occurred near here, including the Edmund Fitzgerald in 1975. The original tower was replaced in 1861 by an iron pile tower, which withstands Lake Superior's severe winter weather better. 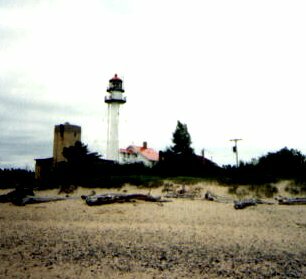 Located 11 miles north of the village of Paradise, Whitefish Point Light is also the site of the Great Lakes Shipwreck Museum. A couple of the items in the museum are the ship's bell from the Edmund Fitzgerald, which was recovered from the bottom of the lake in 1995, and the 19 foot tall revolving second order Fresnel lens which was removed from the White Shoal Lighthouse in northern Lake Michigan. When the St. Mary's Falls Ship Canal opened in 1855, vessels passing from Lake Superior into the canal came close to Point Iroquois through a narrow passage lined on the American shore with sand and the Canadian side with rocks The Lighthouse Board decided that a light was needed here and the construction of a simple wood house with an attached tower was completed in 1855. The original was entirely replaced by a 51 feet tall brick tower and residence in 1871 , and in 1902 another brick house was added to the residence for the assistant keeper. The Coast Guard transferred the property to the US Forest Service in 1965, and is opened to the public, you can climb the tower and the museum is very informative.